Crusty keto bread recipe that is perfect for sandwiches and does not have an eggy taste. 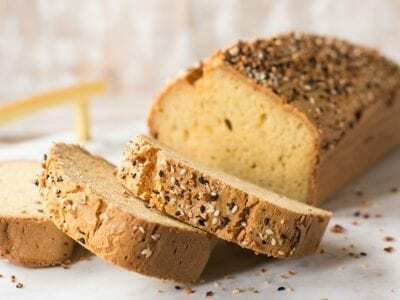 The best low carb bread recipe for the keto diet. This low carb bread recipe could be the best one I have ever seen or tasted! The texture of this bread is remarkable, golden and crusty on the outside, and moist and tender inside. As I type this blog, I am eating the same roast beef sandwich pictured below. What makes it even better is the fact that I griddled the bread slices in hot butter first. So epic! 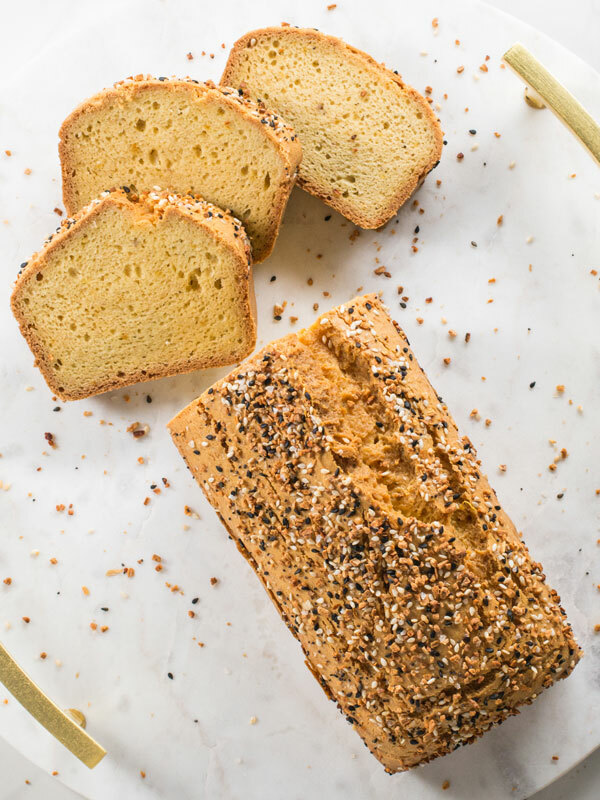 This keto bread is grain free, dairy free, and gluten free, but the texture still resembles that of starchy bread. It’s crazy. We saw this bread being made on the Netflix documentary ‘The Magic Pill’. They did not give the recipe, but we knew that we had to make it at home, and luckily for us, there were only a few ingredients and it could not be easier to make! This low carb bread is made with macadamia nuts, coconut butter (not oil), and eggs. I believe this recipe will work with almond butter as well. Since the bread has no gluten, you can mix it in the food processor without worrying about over mixing the batter. Very rarely can you actually mix a bread like this. You have to knead it. Just make sure to bake the bread in a non-stick or well greased bread or meatloaf tin. Don’t use silicone molds because they don’t conduct heat as well as metal. Here are some questions that are going through your mind right now about how to make keto bread. Do I have to use macadamia nuts for this recipe? Yes, the macadamia nuts have a high fat content, which makes the batter silky and smooth. You can try to do it with peeled almonds, but I am not sure it’s going to work. Can I use almond butter instead of coconut butter? Yes, you can use almond butter. Just make sure it’s soft and pour-able. However, note that the texture of the bread will be a bit different with the almond butter. I’ve done 50% coconut butter and 50% almond butter – it works great. If you are allergic to coconuts, use almond butter and almonds to make the bread. Where do I buy everything bagel seasoning? You can buy it at Trader Joe’s or use the Amazon link I have below. The flavors of the onion, garlic, and salt together are magical. Why does my bread have a green tint to it? Your bread may come out with a green tint if you omit the lemon juice or don’t properly combine the lemon juice with the baking soda. The baking soda needs acid to get activated, so right after adding the baking soda, pour the fresh lemon juice right on top of it, so it can activate. 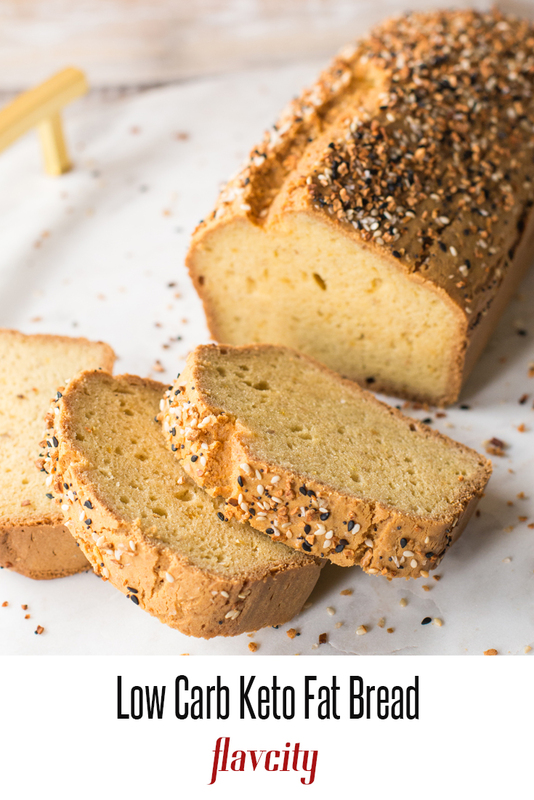 Most gluten free bread recipes have a lot of starch in them in the form of rice flour, tapioca starch, and potato starch. 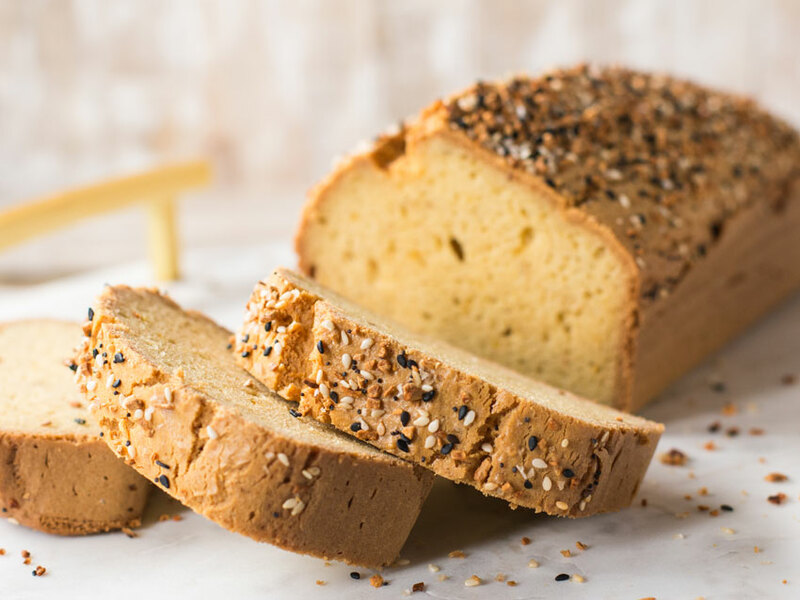 This bread is starch-free, so you don’t have to worry about any bloating feeling or all those starches converting into sugar and spiking your glucose levels. I have tried many gluten free breads in the past. This one is my new go-to. I also have a gluten free bread recipe for Cloud Bread. It comes with a delish roasted chicken salad to make a killer lunch you can take to work or school. I just updated the recipe based upon some feedback I received from you guys. It’s very important that you mix the coconut butter very well as the oil can sometimes separate from the butter. It’s best to place the glass jar in water so it gets soft and then mix very well. Check the expiration date of your baking soda – that could prevent the bread from rising to its full potential. Once the batter is thoroughly mixed, transfer it to the bread or meatloaf tin asap and then into the oven. Otherwise the fat will start to pool at the bottom. This recipe for low carb keto bread is outrageously good. The bread has a golden brown crust, and a light texture inside. 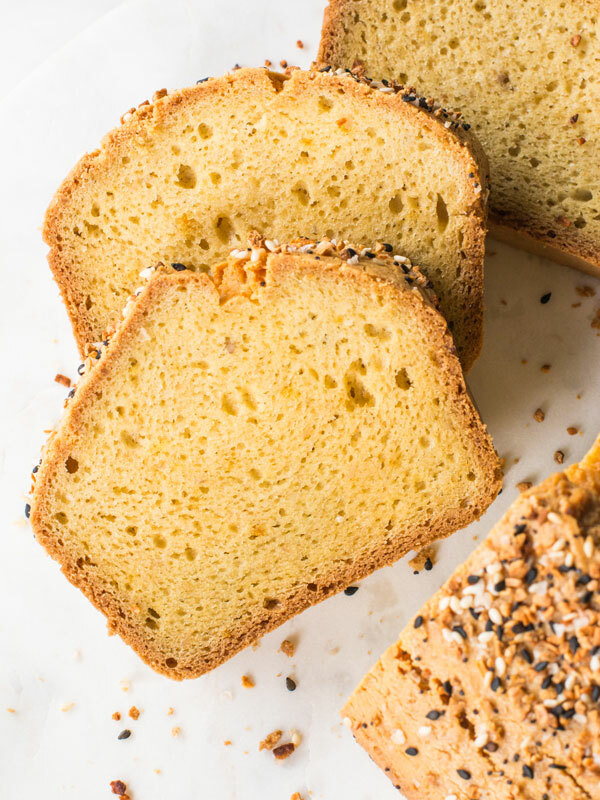 The keto bread is perfect for making sandwiches, french toast, and more. Preheat oven to 350 F and make sure the oven rack is set in the middle of the oven. Add the macadamia nuts to a food processor or a powerful blender and process for about 30 seconds, until almost creamy. While the machine is running, add the eggs one at a time, making sure each one has been incorporated into the batter before adding the next one. Turn the machine off and add the softened coconut butter and salt, and process until smooth and creamy. While the machine is off, add the lemon zest, the baking soda, & juice. Make sure to use fresh lemon juice and it right on top of the baking soda to activate it. If you don't do that, there's a chance your bread will turn green. Process for 10-15 seconds. Line the inside of a non-stick 10 x 4.5 inch bread or meatloaf tin with parchment paper, see how we did this in the video below. If you don’t have parchment paper, rub the inside with coconut oil or avocado oil or spray it with a cooking spray. Pour the batter into the tin and tap it on the counter a couple times. 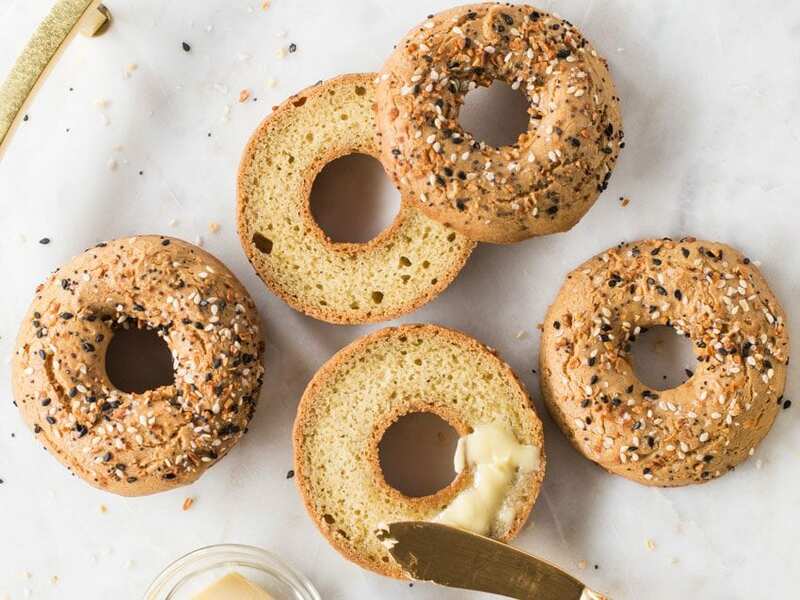 Sprinkle as much of the everything bagel seasoning as you would like and use your finger to gently press it down into the batter so it does not fall off. Bake in the oven for 35-38 minutes, or until nicely golden brown on top. Remove from oven, allow to sit in tin for 5 minutes, and then lift bread out using the parchment paper and transfer to a cooling rack for 15 minutes. If you don’t have a rack, rest the bread on the side of a plate so it can breathe. Slice the bread and enjoy! Bread will keep for 3 days in the fridge in an airtight container or can be frozen for 3 months. 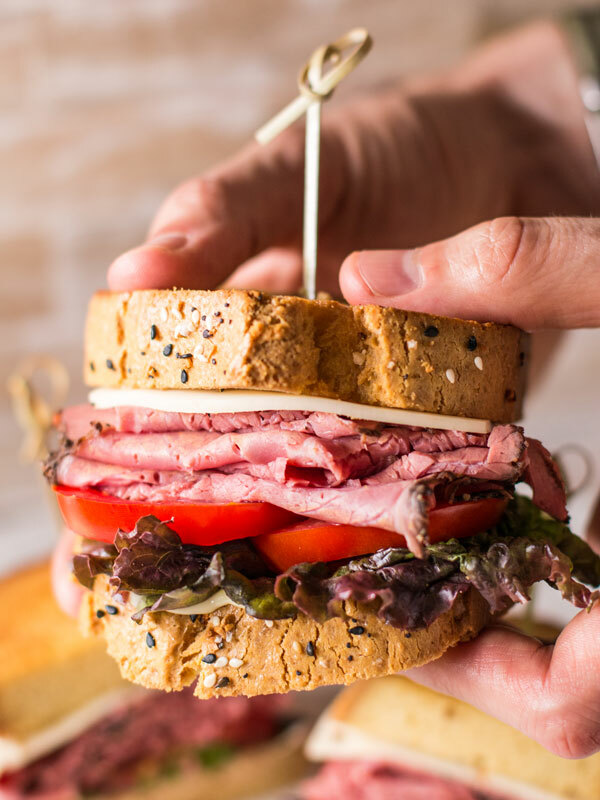 Watch the video below to see how we make an epic griddled roast beef sandwich! It's very important that you mix the coconut butter very well, sometimes the oil can separate from the butter. If you need to, you can place the glass jar in water water so it get soft, and then mix very well. Check the expiration date of your baking soda, that could prevent the bread from rising to its full potential. Once the batter is thoroughly mixed, transfer it to the bread or meatloaf tin asap and then into the oven, otherwise the fat will start too pool at the bottom. If you can't find everything bagel seasoning, make a mixture of sesame seeds, garlic granules, onion granules, and salt. Hi, this looks amazing, thank you so much! I’m new to the site & keto, can I ask how you calculate the nutrition information for the bread? hi Bruce, I use 2-3 different websites to double check the nutrition of each ingredient before adding everything up. It takes a while, but you gotta verify bc some sites are off. Use http://www.recipal.com and it will save you a ton of effort. i used cashews instead of mac. nuts and it was incrediable. Cashews do not have a lot of carbs so i tried it because my store did not have mac. nuts. I found you when I was doing meal prep and Whole30 and now Keto. I work for a national weight loss and management organization and am thrilled to tell you I have recommended your amazing videos and recipes to over 300+ members. I truly enjoy your videos Bobby, love the t-shirts and so appreciate your passion. Plz give alternatives to anything coconut in your recipes because I’m allergic to coconut. all I have is coconut oil and regular butter. Can I try 1/2 of each? Hi Pamela, you really need the coconut butter/manna – which is a lot thicker than oil or cow’s butter. I made this bread. I don’t bake very much so I was nervous lol. The bread tastes great. But, the top of my bread deflated after it cooled. It was ugly but tasted great. hmm..wonder why it deflated..what size bread tin did you use? Directions say baking soda…?? Please clarify. Thanks for catching that. It’s baking soda! Hi from Australia, guys. I reckon the recipe called for baking ‘soda’ is because of how it interacts with the lemon juice to become the raising agent (Demi will be able to confirm or correct me here). Using three times the amount by substituting baking powder may affect macros (not by much though; so little is normally used) as its raising agents are mixed in with wheaten cornflour. i used 1 tsp of baking soda (sodium bicarbonate) and i can really taste it in the bread. is it ok to use less next time? You can try it – it won’t rise as much. It would work best if you use both baking soda and baking powder and lemon juice (as listed in the recipe). Can’t wait to try this! New to the keto family and I can’t tell you how happy I am to have found your IG page. You give such get recipes to try and for me that was the biggest road block.. (what to make?) . Do you have a keto friendly pancake recipe? I can’t wait for that. No food processor. Maybe mix in a blender? Looks so good! If you have a powerful blender, yes, that will work Nancy! I don’t have one either so I used my Ninja and it worked just fine! Where can I buy coconut butter or does anyone know how to make it. Amazon has the best price for coconut butter: https://amzn.to/2L7ZUGd some people make it from coconut flakes, but its not as good as the one we bought bc its made from coconut meat. I have macadamia nut flour. Does anyone know how much would equal a cup of macadamia nuts?? 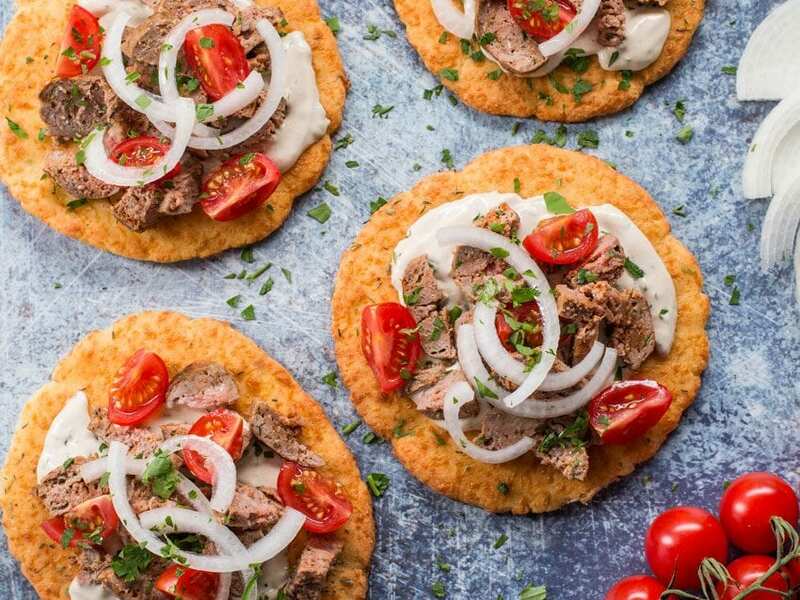 This recipe sounds awesome as I’m always on the lookout for a decent low carb or keto bread recipe! Wow..i have not seen that flour before! it should work, i am just not sure how much flour to use. Did anyone figure out how much macadamia flour would work? i looked into this, go ahead and use 1 cup of the nut flour..its pretty close to a 1:1 ratio! Did anyone find the macadamia nut flour on amazon? Looked and didn’t see it. Hi Rhonda, it’s actually just ‘macadamia nuts’ they are whole, it’s not a flour. You should be able to find that on Amazon. Thanks for the love Suzette! Hmmm.check the expire date on your soda..there are so few ingredients, so that may be the issue. As long as you followed the recipe and you really combined the batter well, it should be perfect every time! Thanks for the quick reply! I don’t know the expiration date on the baking soda because I emptied it into an air tight glass jar but that was quite a while ago, so I suspect this must be the issue. I know there’s a way to check and see if the baking soda is still good, so I’m going to google how to do that. Regardless, I’m going to use fresh baking soda the next time I make this. Another question…..when you make French toast with the bread, do you leave off the Everything But the Bagel seasoning? I made a savory french toast dipped in eggs, buttermilk, vanilla, and cinnamon…topped it with bacon, eggs fried in bacon fat, and avocado 😉 If doing sweet, you can leave off bagel seasoning. I wanted to let you know that I tested out my baking soda and it seems to be okay. I’m going to try making the bread again because, no matter what, it tastes amazing! I am not completely sure, but as an experienced pastry chef, I suspect the bread was undercooked so it was a bit soft and collapsed. If the baking powder was the issue, it would not have raised at all. Also, do not mix the lemon and baking soda at the same time.. add the BP as the last ingredient, to prevent the chemical reaction (too early). I have tried several of your recipes and none were failed. Thank you for continuing creating and sharing the recipes with us. I can’t wait to try this bread recipe. Thank you and your team again for all of hard work. Just made this bread this morning, and I really like it! I’ve tried a few recipes, and this is the most moist and least eggy tasting. I added extra lemon zest (Y.O.L.O.!) and it reminded me of that lemon loaf cake from Starbucks! This was my first time purchasing coconut butter, and the consistency of mine was very different than the consistency of yours (in the YouTube video). Yours was soft and melty, but mine was firm, kind of like a less-moist version of coconut oil. Did I buy the wrong thing? It still tasted delish! Right on Megan..you are a rebel with the lemon zest 😉 You can also make sweet bread by using stevia and even dark chocolate chips w/o sugar! The consistency can sometimes be diff. based upon the temperature, I think you bought the right stuff. You can stick the jar in some war water and that will loosen the texture! I made mine using the zest of a whole lemon (happy mistake). I can see how this can turn into a dessert bread with just a few tweaks. Loved this bread and it was the least eggy bread I’ve tasted thus far. I didn’t even think “eggy”. Definitely my favorite. In the past, I’ve purchased Tropical Traditions’ coconut butter and it’s way firmer than Nutiva’s. I think it’s because the latter has more coconut oil than the one I used to buy from Tropical Traditions. Also note, that the butter’s from both companies should be melted in a water bath, mixed and then used. Did the bread turn out two-toned for anyone else? The lower half of the loaf is a few shades darker than the top half. It’s almost like a denser liquid settled to the bottom while it was in the oven. It still tastes great. I didn’t have everything bagel seasoning so I used sesame seeds and dried orange flakes instead. Love to hear that Julia! Did you make sure to mix the batter very well and was your baking soda old/expired? That can be the only explanation. Just tried this recipe today and it’s a winner!! I haven’t been able to enjoy bread since I was diagnosed with diabetes about 15 years ago and this is a game changer. Thank you!! That interesting, bc we did not really taste any of the nut or nut butters, did you mix the batter very well? Perhaps you need to make it more savory by adding a bit more lemon juice, some fresh or dried oregano or thyme, or sun-dried tomatoes to the batter? I did mix it well I used a food processor like you and Dessi did in the video. Maybe the coconut butter I used was too strong- I used Artisana organics Raw coconut butter. What’s so sad is I can tell that if the bread’s nutty taste was milder, it would be perfect! I’ll have to try adding the lemon and other seasonings that you suggested. Maybe I’ll use less coconut butter.. I’ll report back. Thanks!! Hi Madison….I just wanted to let you know that I used pink Himalayan salt in mine and it isn’t salty at all. Mine doesn’t taste nutty, either. I didn’t even add the lemon zest because the lemons I have are not organic. Perhaps you didn’t mix it well enough as Bobby suggested? I recommend you try it again before giving up on it. It is SO GOOD!! do you know what the macro count is per slice? Yes, it is listed below the recipe! If I dont have coconut butter can I use something else? I’m in Alaska and things take a long time to ship here. I hear ya Autumn! Almond butter works well, some people also said they have used good old butter! Exactly! I used baking soda like the video says I just ruined 5 perfectly good quality cage free free range eggs 🙁 consistency wasn’t even of batter it was like liquid!????? I used exactly what was said and I did it exactly how it was instructed. I’m an excellent Baker I bake bread all the time. Curious what went wrong… actually came on to this website to see if anyone else had the same issue. Everything I used was fresh and organic. The batter was liquid!? Did you use coconut butter or coconut oil? Sometimes the butter gets separated in the jar and you have to mix well or heat the jar and mix. Thanks April, you certainly can can freeze it! Does it taste like coconut? It really does not have a nutty or coconut flavor, just a lovely savory taste. 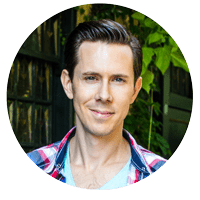 Love the site and the youtube channel – you’ve really become my ‘go to’ for Keto recipes. As such, I wonder, would you be able to tell me how much paste the 1 cup of macadamia nuts makes? The reason for this is that I have macadamia nut paste (just pure nuts ground up) but not actual nuts…. (Hopefully that’s clear?!) It would be a huge help. Thanks so much, glad you found our blog and YouTube channel! Go with 1 cup of nut butter paste 😉 Enjoy! This is the best keto bread I have ever tasted. The use of macadamia nuts as a base was absolute genius. Ever since I went keto, I have tried almond bread coconut bread neither of which I like the texture. It feels like I am chewing almonds or coconut flakes. I had to put it back in the oven for an additional 15 minutes. I didn’t put the seasoning on top but will add it when I toast my slices. This is heaven. I finally have toast for the morning and bread for sandwiches. Thank you ever so much. Your channel and website rock! Super simply recipie. It is in the oven now and I can’t wait to taste it. Not gonna lie, I taste tested the batter and it was yummy! How should I store this? Do you think I can pre-slice and store in the freezer? Thanks! Love your videos and recipies!!! Ha, sometimes you gotta taste the batter!Yes, you can pre slice and store in the freezer, just like sandwich bread 🙂 Enjoy! Oh my Lord please disregard my questions about how to store this bread. I guess I overlooked it but I see it is in the directions!! Duh!!! Would pecans work as a replacement for the macadamia nuts? nope, they are not as fatty and the brown skin will ruin the batter. Getting ready to make this, but noticed your bread pan is much skinnier and longer than my standard one. Will it work with a smaller pan? as long as your bread tin is not too wide, otherwise the bread wont rise..it will be flat! This is a really good bread! I only had jumbo eggs available so that’s what I used. What size eggs did you use? My bread batter was definitely more loose than in your video, and came out with more of a cooked French toast texture. It’s delicious once I toasted it in a dry pan, but any ideas on how I can come up with a more bready texture? maybe it was loose bc your eggs were jumbo!!! yup, sometimes that color happens bc of the baking soda. so glad you enjoyed! I am very excited about and happy for this recipe! I did not have “everything” seasoning, but did have adobo, which I sprinkled on top- very good, but I think I will mix a greater amount of adobo in the batter for my next batch. It looks like there is a gradation in the coconut oil in the bread- it is darker in color on the bottom, lightening until golden just under top crust. Would a slightly hotter oven prevent this settling? My oven temp is accurate – I have an in oven thermometer to check against the dial selected temp. the gradation happens bc of the lemon juice reacting with the soda!! Has anyone made this into more of a sweet bread? Also could I substitute butter for coconut butter? I made it with the coconut butter and the texture and everything was fantastic but I really dislike he flavour of coconut unless in something sweeter and I could definitely still taste coconut. you can defo turn into a sweet bread by adding any ingredients you want. I am not sure if butter would work..we gotta test that! Yes, I added juice and zest of whole lemon instead of recipe amount, added cinnamon about teaspoon, teaspoon vanilla extract, three tablespoon swerve (I think next time will try stevia), half tablespoon almond extract. I added the baking soda and lemon at end. It was awesome. Hi MB, great job, so yours was more on the sweeter side then? Made this bread yesterday, and it turned out wonderful. So flavorful. I especially love the texture. Almost like a slightly more dense, heavier version of angel food cake. 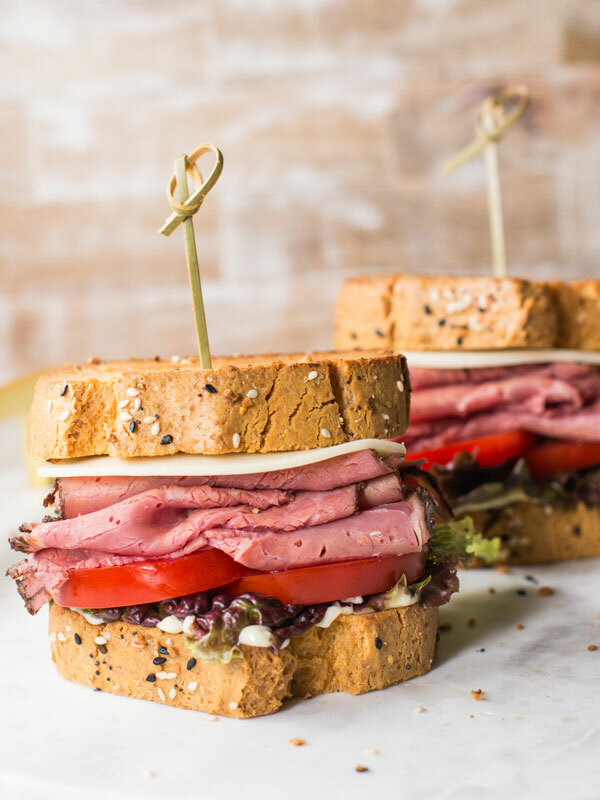 Now I can add sandwiches back into my diet 🙂 Thanks for this recipe. Could I use salted macadamia nuts and leave out the salt? I have a Costco bag of salted macadamia nuts…. Flavcity knocking it out of the park again! I made this bread today for the first (of what will be many) times and it is amazing! Truly the best keto bread recipe out there. I love that it was truly bread-like and not like the typical “egg loaf” recipes I’ve tried. Now to go put away the rest and get ready to make your Moroccan chicken stew again tonight. Flavcity has become my and hubby’s new fav to watch and get recipes from! Can’t wait to try more! cookware..I like how you think Esther 😉 Thanks! Hey guys!!! Loved the video! Love how you and Desi get along. Hiii Art. The recipe is EXCELLENT. Just finished mine and it was a 92% success. I got excited with the lemon and put the lemon juice of an entire lemon, but it was still delicious. I read in your blog what to do with the coconut butter. Great idea cause I had a hard time scooping it out. Now the question that I have is that my bread did not rise enough. Is baking soda and baking powder the same? I used baking powder. I also used a blender that has double blades on top and the bottom. Could that be the reason it came out a little soft? It was a little dense. Overall, I love the taste and my husband who is my biggest critic loved it. Made him a grilled cheese sandwich and he ate it all. LOL. I wish I can attach a picture. Thank you guys for educating us that are not creative in the kitchen. hi Esther! You really wanna use baking soda to help it rise and make sure you mix the batter well..but it sounds like your blender should do the trick! Grilled cheese was a good call 😉 Thanks! I made the keto bread! Wow I’m so impressed – it’s amazing and the everything bagel topping is a nice flavor. I used raw macadamia nuts and mine looks a little different color inside than the nice yellow. The flavor is good but I’m going to use the roasted macadamia nuts next time! You guys are awesome – I love your site! Your my new keto fav!!!! Hi guys! I made the bread today and it came out exactly like in the video! It is very tasty! 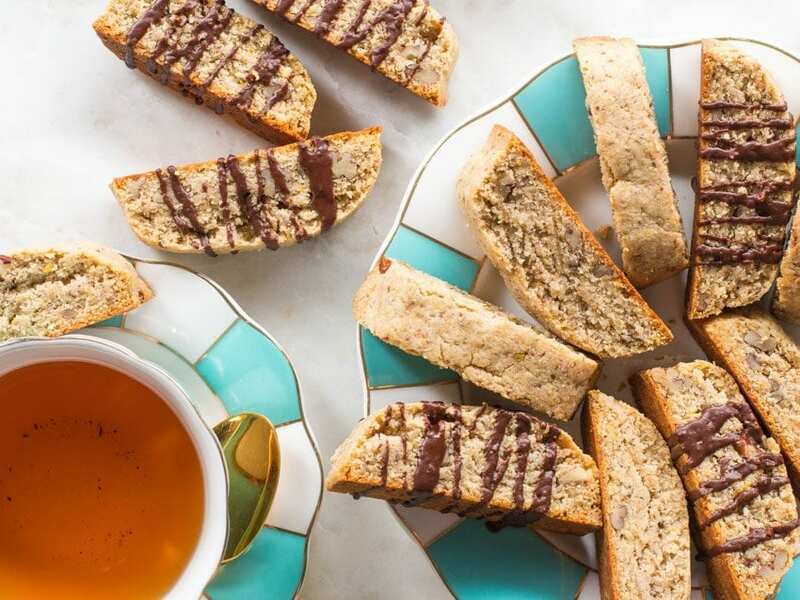 I can’t wait to try your biscotti! Thanks for the recipe! I hope you make more vegan or vegetarian recipes because I am a vegetarian. Keep up the good work! This keto bread recipe is DELICIOUS!! Maybe I used too much lemon zest but if I would have added monk fruit and eliminated the sesame bagel seeds, this would have been a wonderful keto pound cake. Thanks for sharing!! I just made this bread. Was looking so so forward to it. But it turned out half green on the bottom half… sad! Cause the top part smells and tastes amazing. I figured, my soda had expired and I didn’t mix the batter very well. I’m going to try it again though. With fresh baking soda. Hi Scott, I would not recommend that. Yeast needs sugar to activate, and there’s none in this recipe. The baking soda is all you need. Question is creamed coconut the same as coconut butter ? That’s what I have available and I really want to eat bread today. Only day I have free to meal prep. Yes, Stephanie, coconut cream is coconut butter! OMG you guys are amazing! Every time I try and stick to keto I fall off after a month or so… it’s so boring and I feel like i’m missing out. I randomly stumbled upon your channel and I looove it! The pesto Gnocci was amazing! OMG you guys are amazing! Every time I try and stick to keto I fall off after a month or so… it’s so boring and I feel like i’m missing out. I randomly stumbled upon your channel and I looove it! The pesto Gnocci was amazing! Can’t wait to try this bread! Keep them coming!! Hi Michelle, so glad you loved it! We have a ton of creative keto recipes and will post more! Where do you buy the coconut butter from? I’ve seen it only at Wholefoods I think. How do you soften the butter? Is it ok to melt it?? Hi Katy, you can soften/melt it in the microwave, or in a pot of hot water. Greetings. The recipe is fantastic. The only issue i encounteted was that the slice of bread was not stable to make a sandwich. It was too flaky. Any suggestions to improve the texture ? Shariq, be sure that the ingredients are really blended together, if the consistency of the batter is chunky that may result in a less stable texture of the bread. Also a thinner slice will be more crumbly than a thicker one. Hello from Arizona! This bread is amazballs. First time baking I was scared especially because the macadamia nuts at my local sprouts were 20 dollars a lb. So yummy even my 2 little boys loved it. Bobby do you recommend somewhere I can get the nuts for cheaper? Adriana, Trader Joe’s or Costco have the best price for macadamia nuts. So glad you and the kiddies loved the bread! Sheri, so glad to hear it!!! I’m jealous you grew up with a macadamia tree in the back yard :). Love to hear that the kiddies loved the bread too!!! Eshwarya, good luck and do let me know how it goes!! I didn’t havemacademia nuts so I used cashew instead and added a couple drizzles of olive oil and also added almond flour to help the texture. Final result….excellent! WOW!!! Great job, Helen! Glad it worked out, I’ll have to try this variation (although cashews are pretty high in carbs). Wow! I thought I’d have to make this a couple times before it came out good but following the video made it super easy! I used a Vitamix on the two lowest settings and it mixes perfectly. That’s great. Hope you enjoy making it over and over! For our first attempt, my wife and I tried using the closest thing we could find to coconut butter; a product called Pure Blends coconut oil plant-based butter from Kroger. I must admit we do not bake very often so this was very much a learning experience for both of us. This product seemed promising because it tasted just like any other butter spread and looked very similar to the video in terms of consistency and color. This was a huge mistake! The batter was very runny and came out of the oven like a mix between a custard and a quiche. It also had the slightly greenish-purple discoloration mentioned in previous posts. Even though our baking soda doesn’t expire until 2020, it does say on the side of the box to discard within 30 days of opening which is the most likely explanation. We are trying this recipe again with all fresh ingredients and using the same Nutiva Organic Coconut Manna ordered from Amazon. Here’s hoping the next batch comes out perfect. Thanks for the awesome videos! I made this bread today and it is delicious. Mine was darker in color than picture shown in this recipe. I was wondering could this recipe be used for buns for hamburgers? Will look forward to your reply. Thanks for such a tasty bread!!!. Hi there. We just tried this today and the. Read came out super moist. Almost too moist. It was more like cooked French toast consistency than the nice airy sandwich bread you have here. Any suggestions? Could this be made with regular room temperature butter? Hi Tammy, did you use coconut butter (manna)? Regular butter would not work for this recipe. Very good! The absolute best keto bread and compare well to regular bread! Only one issue, it’s so expensive to make! Thank you, Elizabeth! I hear it! Those macadamia nuts are pretty pricey! I tried this recipe as is and bread had a macadamia nut after taste and the bottom half of it was green in color. I loved the texture though. So I changed the recipe by adding juice of whole lemon and added sweetner, vanilla, almond extract, cinnamon and ground almonds at top to make a pound cake. It was delicious as a sweet bread. I dont know what I did wrong with the savory version. I wish I could correct to have as a sandwich bread. I made this recipe today and after I made the batter I realized my pan is a 9.5×5 inches. The bread is delicious but it didn’t rise. How can I modify the recipe so it can fit my pan or should I just buy another pan? Love your recipes. I have made your fat bread into a lemon pound cake and my family loves it. KETO OR NOT. Thank you! Ha! Great job MB! Keep on cooking! I went ahead and tried making this bread and the batter was very liquidy. It was not thick at all. Any recommendations on what could have been wrong? Did you use coconut butter, and follow the recipe exactly? That is exactly how mine turned out and it was ‘green’ on the bottom. Taste was good, but it was also eggy. Just made this…pretty tasty! Has anyone tried to make it as a yeast bread? I have not done so but it sounds intriguing! Good Morning Mr. 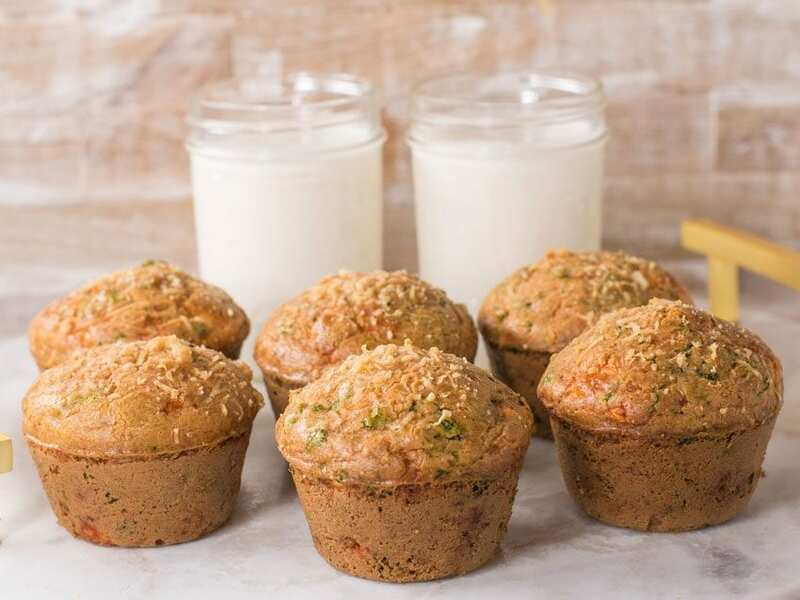 Parrish..I am so happy i came across your website..I am going to take on your keto bread making this weekend..I wanted to ask? Could you use this batter to make a pancake? I have yet to master a good keto pancake, . Just one word…. LOVE !! So glad you liked it, Nat! Keep on cookin’! Delicious but more like cake than a bread texture. Wish there was a bread that was the size of a true slice. All keto breads seem to be short! Glad you enjoyed. I agree that it is difficult to COMPLETELY replicate bread and not have it be “bread” but I think this is about as close you can get and have it be keto. Can you use onky egg whites or can it be whole eggs? I tried your recipe and it turned out a disaster. I’m not sure what I did wrong. I think I could have over mixed it at the end as it kind of curdled. When it was cooked. It had a blackish bottom and tasted disgusting. Too eggy. And really salty. I had to throw out. My poor son nearly puked. I didn’t add the lemon cause I didn’t have any. Any ideas on what I did wrong? I want to make this, but do not have a food processor. Can I use my Blendtec blender on a lower speed? I have never used that blender. I would suggest a food processor for this recipe, but if your blender can serve well as a food processor it might do the trick. I made this with a Blentec blender and it came out perfect! Thank you so much for this recipe. So happy you liked it! Keep on cookin’! just found the site, I love it! I am would like to see more keto and GF recipes please. If you like keto and GF then you’ve come to the right place! Make sure you also subscribe to the youtube channel (and click the bell for notifications) to stay up to date on all our recipes. Thanks for finding us! I made this today, and it came out really nice. I think I might have used salted macadamia nuts so it tastes a little salty. But that is ok. The bread texture is good, nice and moist. However, it tastes eggy. Do you know if I can perhaps use half regular eggs and the other half flax egg? Thank you for your recipes. You guys are amazing. Just made this recipe. Bread taste amazing!! Love the consistency. It did not rise as high as it should have. I will try a smaller pan next time. I want to try it with almond butter next time to see how it comes out. Try whipping the eggs longer next time – that might help. Keep us posted on how you like it with almond butter. Keep on cookin’! Fantastic recipe ,turned out exactly the way the picture shows . All my friends loved it and amazed by the outcome . That is so awesome! Thanks for letting me know you loved it and got some rave reviews! Keep on cookin’! This looks incredible! I am on Keto. I am going to sub the nuts for Lupin flour and see how that goes. Thank you for the tasty recipes. Never heard of lupin flour – please do keep us posted as to how it goes! Thanks for chiming in and for watching/reading!